Presented by The Southern Association of Workers’ Compensation Administrators and The Self-Insurance Guaranty Funds of America and Sponsored By WCI, The Workers’ Compensation Institute. The College, recently renamed in honor and memory of the late Roger L. Williams who was the former Chair of the Virginia Workers’ Compensation Commission and a past president of SAWCA…will be held August 20-21 in Orlando, Florida in conjunction with the Workers’ Compensation Institute’s 73rd Annual Workers’ Compensation Educational Conference & 30th Annual Florida Safety & Health Conference. The College is a program specifically designed for regulators, legislators, and those who periodically must fulfill the role of a state regulator though their primary occupation may be that of an industry professional. This “Executive Level” seminar lasts for two full days and engages the “students” in discussions on topics that cover the full scope of regulatory responsibilities faced by today’s state officials. Whether you are a recently appointed regulator or a seasoned veteran; a legislator responsible for passage of workers’ compensation legislation or a judge responsible for determining cases; or an industry professional appointed to state agency boards and commissions, the value of the curriculum…your fellow students…and the nationally renowned faculty will be immediately apparent and a benefit for years to come. If you have additional questions regarding the College please contact Gary Davis at 859-219-0194 / gary.davis@sawca.com for any questions. The 3rd Annual National Workers’ Compensation Regulators College was held August 22-23, 2016 in Orlando, Florida in conjunction with the Workers’ Compensation Institute’s 71st Annual Workers’ Compensation Educational Conference & 28th Annual Florida Safety & Health Conference. 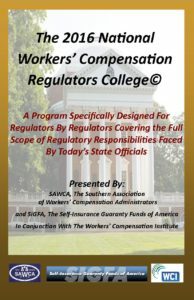 In 2015 SAWCA held its 2nd Annual National Workers’ Compensation Regulators College…a program specifically designed for regulators and those who, from time-to-time, must fulfill the role of a state regulator though their primary function may be that of legislator or industry professional. Please click the link below to view the brochure for the 2015 National Regulators College and contact Gary Davis at gary.davis@sawca.com if you have questions regarding this year or the 2016 College.